Although you are all far too polite and sweet-natured to write this I am aware that I have a tendency to rabbit on in my posts. Today a nasty sore throat is making me less talkative than usual so, with a little luck, there will be more pictures and less words. Hurrah! We are halfway through our school holidays and may I just say how much I LOVE the February holidays? It's the last chance we have to snuggle inside and craft, read, and bake before the glorious spring weather pulls us outside. This week the skies have been a brilliant blue and the grass sparkling with frost. The sun did coax us out on a few occasions for a brisk walk along the Loire. Our dog, Gaspard, made us chortle with his undiscerning overtures to each and every dog and owner who would cross his path. He is a little embarrassing at times but very adorable too, thankfully. Today there have been a few flurries of snow and Mickaël and Tristan have headed off to Le Mans to change the tyres and give a little attention and love to our 1992 Jaguar Sovereign with the help of a vintage car specialist friend. A few days ago Tristan and I went to Tours to have a drink together, buy macarons, watch the ongoing work on the new tramway, and most importantly to purchase a few classical music recordings with his birthday money because my son simply adores being lulled to sleep with guitar or harp music. Right now I am listening to one of the three cds we chose together: Le Salon de Musique de Marie-Antoinette. I strongly recommend it. It is beautiful and calming; just right for Tristan. I love this little sweetheart of mine for being courageous in sub-zero temperatures and showing off that smile (we call it The Boudazin Smile) uncannily similar to her father's and grand-father's! There has been a batch of Lemon Curd whisked up this week too. I love French Tarte au Citron but Lemon Curd is so quintessentially British to me and conjures happy childhood memories. I have given up butter and chocolate for Lent - goodness knows how long that will last - but I have found this amazing French Lemon Curd recipe which has no butter in it. It is made in minutes, tastes sublimely tart and, quite honestly, I don't think it will last for long in this household! Wash and zest the lemons (the recipe suggests 2 lemons but I recklessly zested all 4 with wonderful results) and place the zest and juice from all 4 lemons in a saucepan with the sugar and cornstarch. Stir whilst heating gently. Wisk the eggs and add to the warmed ingredients in the pan and, over high heat, stir continuously until the lemon curd thickens. It took me about 5 minutes. Pour into a sterilized glass jar. May I introduce you to a little spring bunny? Along the banks of the river Loire I have caught glimpses of delicate pink blossom bursting timidly forth on windswept trees which have inspired me to create Mademoiselle Blossom, a breath of spring air! Pink blossom like frosting on a girl's birthday cake; a celebration of sorts. She is a gentle and refined little lady, both delicate and pale, who relishes French patisserie such as macarons. The ones in the picture are rose and chocolate, vanilla, and honey with lemon. I was fully intending to put her up here shortly after placing her on my shop shelves but I'm afraid to say she has just been purchased as I was writing the opening paragraphs to this post; I'm so sorry! Perhaps it might be a good idea, if you are interested, to pop over to Madame Millefeuilles, my shop, or again, Madame Millefeuilles, my facebook page to stay informed of newly created hares? (I am starting up on some new designs for the shop which I am most excited about). I prefer keeping this space of mine relatively shop talk free! I hope you are all having a wonderful weekend dear friends. It is always a pleasure to read your comments and your thoughtful emails. Thank you so much! Misty, overcast, gloomy, and grey. Oh, and did I mention the rain we've been having? Walking along the slippery banks of the Loire this afternoon we observed a swiftly flowing river with high water levels. It's hard to believe in such moments that the Loire Valley is considered to be the Garden of France. And yet, there have been signs of Spring this week! On Wednesday, the day in France when primary schools are closed, on returning home from Tristan's morning at music school I felt the urge to fling the windows and doors open and ... clean! There was some undefinable magic at work which filled the children and I with gladness and caused quite a stir with the birds in and around our garden. The air resounded with the sound of woodpeckers tap, tap, tapping on bark. It was chilly still - the doors and windows were firmly shut again two hours later - but there was a special kind of sunlight this Wednesday noon which suggested hope and looked down kindly at the crocus heads pushing through the soil ready to join the crowds of nodding snowdrops. I have been delving into some treasured books: The Virago Book Of Women Gardeners and Notes From The Garden: A Collection Of The Best Garden Writing From The Guardian famous in my household for its article about a gnome abducted from a women's garden and returned to her doorstep seven months later along with a photo album picturing him in the twelves countries he visited with his abductor! (You can find both books here and here.) A few pages prior to the Garden Gnome with "itchy feet" there is a different but just as thought-provoking article entitled: "The Female Garden" dating back to May 26 1982. The journalist, Felicity Byran, explained that the three modern gardens she loved most - that of Rosemary Verey near Cirencester, of Eve Molesworth at Iver, and Joyce Robinson at Arundel - were "all creations of women who are gifted and knowledgeable amateurs. It is not just that they enjoy them visually. It is the surprise element, the eccentricity and daring, you might say - odd plants and colours juxtaposed and intertwined regardless of rules - that make them thrilling. They are also happy gardens with nothing rigid about them." 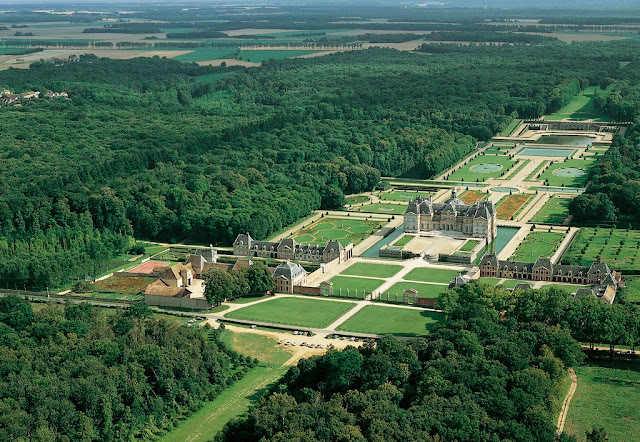 Having pored over French plans and gardening treatises dating back to the sixteenth- and seventeenth centuries, such as André Le Nôtre's Versailles Gardens shown above, I have had more than my fair share of "rigid" garden design. I was intrigued, therefore, further into the same article to read Penelope Hobhouse's thoughts on female gardening: " 'I'm sure,' says Penelope Hobhouse, 'that men feel much more strongly about straight lines. With women it's much more like embroidery - interweaving colours and textures.' "
Of course many prominent women gardeners have also been painters or much involved with applied arts. Gertrude Jekyll is the classic example. Marvellous examples of her handiwork, particularly needlework, still exist, and it was only when she was fifty and suffering from failing eyesight that she turned exclusively to the art of gardening in her home at Munstead Wood in Surrey. Thus began a stream of wonderful books and her famous partnership with architect Edwin Lutyens which created so many enchanted gardens. Hobhouse, an authority on Gertrude Jekyll, feels that she needed Lutyens as much as he needed her. Felicity Bryan goes on to write in her article: 'for only an architect (and only a man?) could make that bold framework - the incredible stone-work, the pergolas, vistas, inverted steps etc - and only she could soften it with the brilliant use of billowing plants and shrubs'. But is it that simple? 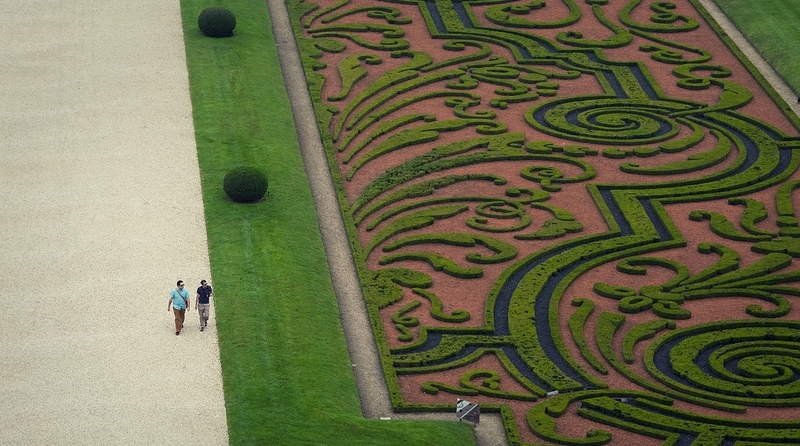 After all, André Le Nôtre and his band of contemporary garden designers were capable of thinking beyond the straight line and embracing the curve as the parterre in the gardens of Vaux-le-Vicomte above testifies! So what do you think? Are men more at ease with rigid design and women instinctive design softeners? I myself am fascinated by both straight lines and curves. This is a detail of my recently completed Driftwood by the talented designer Veera Välimäki. This pattern has a clever twist which incorporates extra lines a third of the way through the design causing the wrap to widen gently. Simple lacework creating curves and straight lines which have soothed me in the evenings and brought me back regularly to the rows of vines being pruned ready for spring. Driftwood knitted with Madelinetosh Pashmina in Sugar Plum which makes this wrap drape spectacularly! Isn't that piece of 1900's tulle with hand embroidered raised dots beautiful? I have the joy of working on a few customer orders (always a pleasure) but I promise to post a few pictures of my next hare to pop into my shop. Spring is approaching fast and I feel particularly inspired to create so should you have a burning desire for an Easter hare, I would be happy to oblige. That's enough shop talk I think. I leave you with a picture of Tristan who has just celebrated his ninth birthday! Happy birthday Tristan! Poetic, musical, considerate, truly sweet-natured, and a prankster! We could not wish for a more inspiring son. Whilst gazing with pleasure the other day at Annie's February Floral Mood Board over at Knitsofacto I suddenly recalled with a whoop of joy that I have in my possession a painting my mother made of her garden flowers gathered in February a few years ago. 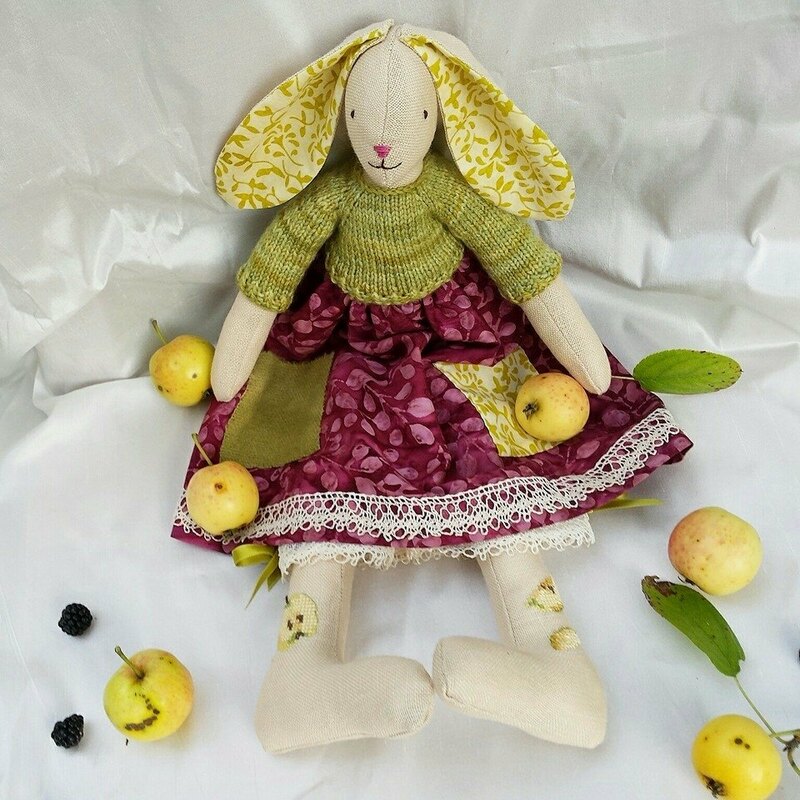 For those of you, like Green Rabbit Design's lady, Vivienne, who are impatiently awaiting the arrival of Lady Spring, my mother's work may gladden your weary hearts. These flowers were flourishing in her garden in the last two weeks of February. Surprising, don't you think? Thankfully my mother painted similar mood boards for the ensuing months. She has always been very good about bringing her garden into our childhood home; small posies often ornamented our meal times and there was a lot of artwork which expressed her passion for gardening and carried us through the winter months whilst the garden was slumbering. Gardening inspires so many art forms. 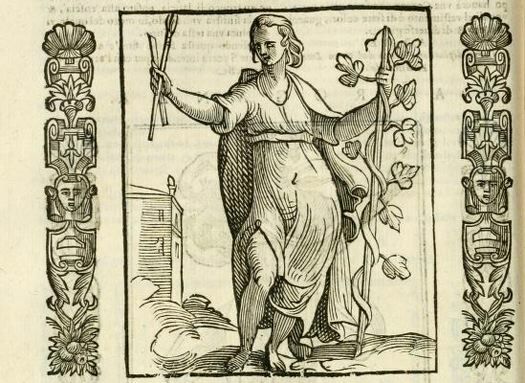 In Cesare Ripa's Iconologia, a frequently reprinted and translated emblem book first published in 1531 - intended to assist the inspiration of poets, painters, and orators - there is an intriguing portrayal of Art. She is portrayed as a woman in a flowing green robe (according to the written description). In her right hand she holds a hammer, a pencil, and a burin, three tools needed for the artist's imitation of nature. In her left hand she holds a stake supporting a climbing palnt. The commentary explains that "the Stake supplies Nature's Defects, in holding up the tender plant". The emblem expresses, therefore, a commonly held idea that art does not just copy nature but improves her. A 'garden' (a plant guided and supported by a stake) symbolises this relationship. I am no painter but, in a similar manner to my mother, perhaps, I do like to express my passion for horticulture but with threads and fabric. A detail of this needlework bag. In gardening, as in decoration, the Renaissance objective was to improve nature or correct it: "t'excell the natural with made delights," as Edmund Spenser put it in 1579. Embroiderers exaggerated the decorative qualities of plants by using gold or silver threads and even pearls and precious stones. Elaborately embroidered costumes and decorative gardens were perfect complements for each other. During open-air entertainments, silk, satin, and velvet costumes embroidered with a dazzling array of small flowers, leaves, birds, and insects must have shone as alluringly as the garden flowers themselves. These cards, taken from a box set from the famous Parisian embroidery school Ecole Lesage, have detailed instructions on the back for each design. Of course gardens have been brought into the home since Roman times - as wall paintings in Pompeii villas testify - until our present day. Think eighteenth-century floral wallpaper or nineteenth-century William Moris textiles. It is a fascinating and extensive subject which I would be delighted to converse with you about for many hours! I feel a little foolish to end this post with doll pictures but Angélique's third birthday (on Saint Angèle's Day, January 27th) brought a new friend to our home. With the arrival of Violette (one of the famous French Corolle dolls) I found another of my childhood memories resurfacing alongside my mother's garden: a passion for making doll's clothes. You may chuckle but this little lady, measuring 13" (33 cm), took France by storm when she became the famous Marie Claire Idées bimonthly magazine emblematic doll a few years ago. She is the perfect model for doll's clothes! This little dress - a little garden inspired - was made with a French fabric which smacks of eighteenth-century textiles. That little cap is so very Holly Hobbie, don't you think? Of course this spring dress was made as part of Angélique's birthday present (she had a lovely birthday, thank you!) but, honestly speaking, it was just as much a gift for the child in me. There will be more doll stitching too. This outfit is only the beginning but I have visions of old-fashioned rather than modern clothes. Now what about you? How do you bring nature and gardens into your homes? Do you prefer detail or simplicity? Both have their places, of course. And finally, please tell me, are there any more doll's clothes stitchers out there? ps I really must update my Gallery of Hares with, for example, my Mademoiselle Valentine, and I think it only fair that the next Mademoiselle available for purchase be shown on this blog at the same time as on Madame Millefeuilles! pps If you are interested in reading matter and references in relation to the connection made between gardening and art I would be more than happy to supply you with a few book titles. ppps Hello Gail! If you are reading this have you noticed that Violette is sitting on the fabric for Lili's hare's dress? pppps All this talk of flowers and gardens makes me think I must change my header for something more springlike!